In a recent article in the New York Daily News, writer Anthony McCarron describes the rehabilitation of Yankee slugger, Alex Rodriguez. Rodriguez changed some little things — made more eye contact with folks he talked to “as opposed to a quick look and his mind already racing to something else,” Long said. He chose the team plane more often, eschewing private jets, and cut down his cell-phone calls at the ballpark. He joined clubhouse conversations, spent time with teammates, tried to be one of the guys. In a related note, US Weekly recently ran an item noting that Rodriguez had two portraits of himself as a centaur hanging over his bed. What follows is an attempt to reconstruct the conversation between Long and Rodriguez during that remarkable November visit. DL: Alex, sit down. It’s time for an intervention. I hate to say this. I know it’s painful. But you’ve got to change. No one on the team likes you. A-Rod (defensively): You like me. DL: Actually, no. I’m on your payroll. Otherwise, I’m not here, I’m playing golf with Posada. DL: You’ve got to learn how to be a regular guy in the clubhouse, Alex. Your teammates don’t — Alex, Alex! Could you please stop staring at the mirror. Look at me! A-Rod (whispering): God, you’re sooooo pretty. I could stare at you all day long. DL: Alex, that’s still the mirror. Turn around. Eye contact. Look . . . at . . . me. A-Rod: Why? You’re not as pretty as I am. DL: Alex, don’t you understand. That’s why I’m here. You act as if you don’t care about anyone but yourself. A-Rod: How dare you say that! It’s not an act — I really, honestly, sincerely don’t care about anyone besides myself. DL: Your teammates think you are a self-absorbed egomaniac. DL: You know, Derek, Jorge, Mariano, Mark . . .
A-Rod: I’m drawing a blank. DL: C.C., Johnny, Hideki . . .
A-Rod: You mean the Japanese guy? Isn’t he my sushi chef? DL: No, Jesus, Alex! And Matsui hates when you call him that. These guys are your teammates. A-Rod: Oh, wait, hold on, I think I know who you’re talking about — you mean the guys who always dress like me? DL: It’s a uniform, Alex. Everybody wears the same uniform. Alex, another thing . . . could you please put down the cell phone for one freaking minute? Do you have to text right now in the middle of our conversation? Who could be that important? A-Rod: I wish I had my own airport. Boras promised me that . . .
DL: Alex, for the love of all that is good and holy in this world. Please. It’s time for you to change. A-Rod: But I want to change! A-Rod (jumps up from chair): Yes, desperately. I’m going to change right now! DL: Alex, Alex? Where are you . . . ? (Long follows Rodriguez into his bedroom, where the Yankee third-baseman changes into a new outfit.) Alex — not that kind of change. 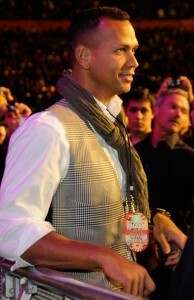 A-Rod: How do I look? Too gypsy? DL: I don’t know, maybe you could make it work. Do you have a pair of boots or something that highlighted your glistening orbs . . . My God! What am I saying??!! A-Rod: Man, I wish I could tickle myself. Isn’t it sad? People can’t tickle themselves. DL: Alex, please, for the love of . . . what the . . . is that a centaur over your bed? DL: Uh, yeah, amazing — that’s a word for it. I mean, there might be other words, too, better words, but — Holy God, there’s another! You have TWO paintings of yourself as a centaur? One wasn’t enough? A-Rod: I’m not sure if two is enough. I’m hiring a guy to paint a new one of me as a unicorn. Except that instead of a horn coming out of my forehead, it would be my . . .
DL: Alex, please, enough already. Just stop. I’m out of here. I’m gone. In fact, forget I was ever here. Just, just . . . keep hitting home runs . . . okay? We don’t care about the rest. It’s baseball. It’s not like it’s a real team sport anyway. A-Rod: Thanks for this talk, Hank. Or, um, Fred? Or, anyway, it was really helpful. I promise you. I’m going to change. Do you think if I tied this sweater around my waist, like this, it makes me look too bloated? 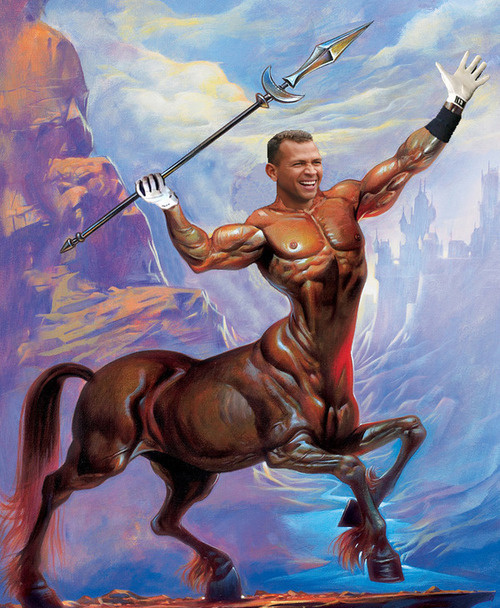 Centaur image from Deadspin.com, courtesy of Jason Fry, from the Faith and Fear in Flushing blog (see sidebar). James Preller is a life-long Mets fan who, as a third-grader, went to Shea to watch the 5th Game of the 1969 World Series. He is also the author of the ALA Notable Children’s Book, Six Innings.